As the single most popular and top-grossing sport in the United States, football is practically a national religion. Over 100 million Americans tuned into the Super Bowl in 2018, a number likely to be repeated this Sunday. Celebrated for its athleticism, spirit, and camaraderie, more recently, the sport has also become infamous for its link to permanent brain injuries. 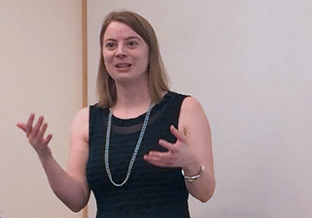 In a recent seminar for the Department of Epidemiology Injury Unit, Kathleen E. Bachynski, PhD ’16, said public awareness on the health risks of football is a good thing, but too often, discussion on this topic has centered on player behavior rather than inherent risks of the game. In recent years, the NFL has set the rules for the way we understand the issue, purchasing public trust by teaming up with some of the country’s most trusted health authorities. The NFL’s strategy follows a familiar playbook exemplified by the tobacco industry’s use of physicians to downplay the health risks of their products (“Doctors smoke Camels,” read one ad from 1949). After years of denying the association between football and brain injuries altogether, in 2011, the league partnered with the Centers for Disease Control and Prevention on a national education campaign, offering young players and their parents what appeared to be the most advanced public health knowledge on how to prevent these injuries. The NFL-CDC campaign recommended that players follow the rules of play, practice good sportsmanship, and use “heads up” tackling, a technique involving lowering the head during a collision. While effective in preventing spinal cord injuries, heads-up tackling has not been shown to be effective against traumatic brain injuries or chronic traumatic encephalopathy, a neurodegenerative disease seen in the brains of many ex-NFL players. A year after launching the CDC campaign, the NFL donated $30 million to the National Institutes of Health. While the league said their gift came with no strings attached, in fact, they worked behind the scenes to influence the selection of researchers for the project. After a Congressional investigation in 2016, the NIH was forced to abandon the project. Since then, the league has earmarked $100 million to fund scientists directly, with its first study focused on retired horse jockeys who suffered concussions when they were younger but appear to have suffered no long-term harms. “The NFL has an interest in funding research that casts doubt on the relationship between brain disease and brain trauma,” emphasized Bachynski. Alongside its grants to researchers, the NFL works to get its message directly to the public. As part of a series of “Moms Clinics,” NFL experts mansplain safety procedures to concerned mothers, many of whom decide whether or not their children should play the game. Another strategy supports NFL-friendly op-eds, such as one in Seattle Times written by a consultant to the league (his conflict of interest was not disclosed). Partnerships with industry begin with good intentions, but the risk of bias is real, she argues. That said, eliminating these partnerships is not without its downsides. The NFL is by far the largest funder of concussion research and is in a unique position to provide insights and access to study the game. Even so, government agencies should do everything they can to minimize industry entanglements, for example by removing the league’s branding from the CDC website and avoiding joint authorship on research publications. In one egregious example of industry entanglement, the CDC hosted an NFL-produced video on its website. In this video, NFL Commissioner Roger Goodell contends that the league sets the standard for safe play; meanwhile, he conveniently ignored the risks of repeated brain traumas of the kind routinely experienced by players. A journal article and op-ed written by Bachynski in late 2017 drew attention to the video, which in early 2018 was quietly removed from the CDC website. With all the confusing information on the risk for brain injury in football, the question remains: how do we better communicate risks associated with football and other contact sports, and how do public health professionals navigate industry-funded research?